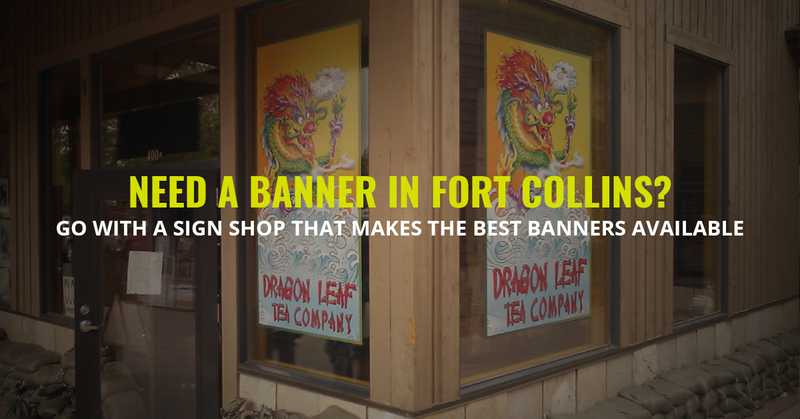 Banners are one of the most versatile types of signs there are, so it’s no surprise that many businesses in Fort Collins and all along the Front Range are looking for the best banners they can find. Banners are very attention-getting, because they are often moving in the Colorado breeze. They’re great for putting up and taking down for temporary sales, especially those that might only occur yearly. They’re moveable, so if they’re not working on one location, you can simply put them elsewhere (indoors or outdoors, or both). When you have them created at a print shop, you can choose large or small, horizontal or vertical. And when they’re not in use, all you have to do is fold them up and put them in storage. But unfortunately, all banners are not created equal. Today we’re going to talk about why you should look for the highest-quality banner printing services you can find in Northern Colorado. Why Go With The Best Banners You Can Find? The point of a banner is to draw the attention of potential customers, but you don’t want to draw bad attention due to the poor quality of your banners. Let’s take a look at what a quality banner will do for you. Colorado is a state of extremes. That’s true of our elevation (from 3,337 feet above sea level to 14,433 feet above sea level.) and our temperatures. It gets extremely hot and cold here in our state, from -61 degrees to 118 degrees in recorded history. These temperature extremes can affect the way the fibers in the banner wear. It’s not just the temperatures that can affect a banner, of course. Colorado also has every type of precipitation, from rain to snow to sleet to hail to graupel. Some of these can happen in the same day! That’s why it’s important to go with a high-quality banner from a sign shop that knows what they’re doing. Oh, and let’s talk about the wind for a second. While we might not be on the plains, the winds that come down the mountains can certainly do a number on banners. (These are often called chinook winds, associated with warm days following cold days during spring and fall.) These winds can not only cause banners to come loose, but also whip around so hard that the fibers get torn. Choosing the right material for banners is an important first step in making sure they stand up to the winds. When people talk about things deteriorating outdoors, they often attribute its failure to the weather. Did your plastic hose reel crack? Or maybe your canvas deck chairs started ripping, even though they are taken inside during the winter months? Perhaps the color of your house is fading on the south side? You’re seeing the effects of the UV radiation from the sun that’s causing the molecules to weaken and break. But it’s the sun! What can be done? There are ways to knock down the level of UV radiation hitting an object. If something in indoors, commercial window film can be put on the glass. But if something is outdoors — such as a business banner — then the UV protection needs to be part of the material in the first place. Do you always need to utilize the ultimate UV protection on a banner? Banners that are going to be out for months should definitely have UV protection to protect from fading and the degradation of the material itself. On the other hand, banners that are being used to promote an event for only a couple of weeks might not need extreme UV protection measures. It’s important for your banner to hold up to destructive elements, but it’s always incredibly important for it to look good in the public eye. First of all, you want the design to be eye-catching. While the primary the point of a banner is to inform, it also has to be enticing enough to catch the eye and then cause a person to act on that information. It’s very important to have excellent design that is both attractive and readable, something that a good sign shop designer won’t have any problem with. Need A Banner? Choose Our Sign Shop! Banners can be a very important part of catching the eyes of people who are in the vicinity of your business. But your banner is also representing your business, and you want your customers to have a good feeling about you even before they get in the door. That means going with the best banners possible. Our print shop is ready to help! We can design and print the best banners along the Front Range, from Longmont to Cheyenne. Contact us today to get the process started!